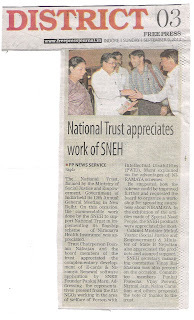 The National Trust , formed by the Ministry of Social Justice and Empowerment , Govt of India, in its 12th Annual General Meeting, held in New Delhi, appreciated the work done by the SNEH specially to support National Trust in implementing its flagship scheme of NIRAMAYA HEALTH INSURANCE. 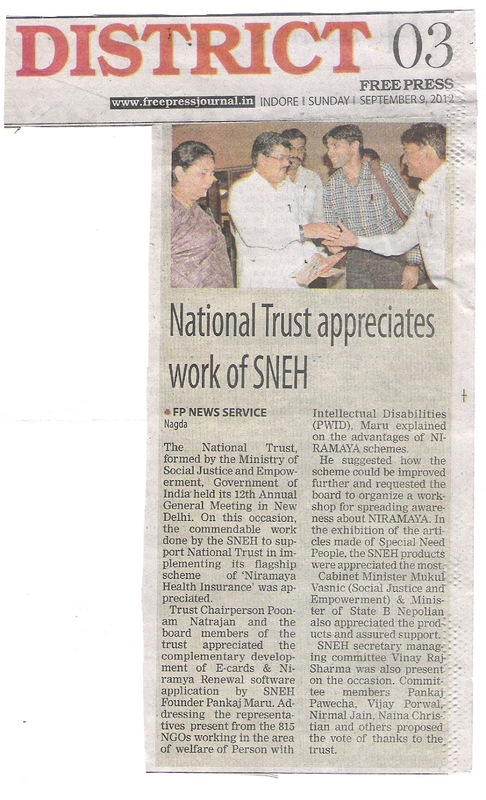 National Trust's Chairperson Mrs Poonam Natrajan and all the board member of trust specially recognized and appreciated the complementary development of E cards & Niramya Renewal software application by Mr Pankaj Maru Founder of the SNEH. 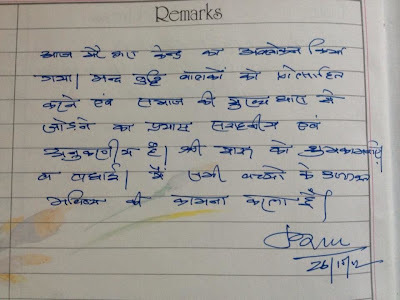 Pankaj Maru addressed to the representatives present from the 815 NGOs working across the country in the area of welfare of Person With Intellectual Disabilities (PWID) and explain how to take the advantage of NIRAMAYA schemes. 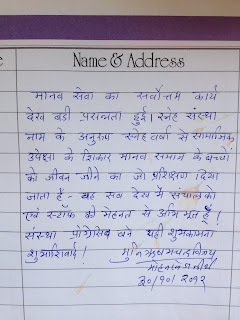 He has given many suggestions for further improvement of the scheme and also requested board to organize a workshop to make people aware about the NIRAMAYA implementation. The board & Chairperson assured to take the matter in the Board meeting favorably. 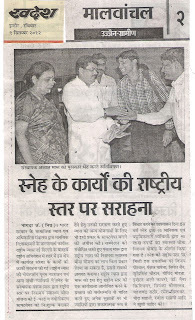 In the exhibition of the articles made of Special Need People, the SNEH products were appreciated the most. Cabinet Minister Mr Mukul Vasnic (Social Justice and Empowerment) & Minister of State Mr B. Nepolian also appreciated the products and assured to support the SNEH in best possible way. 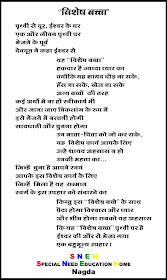 Vinay Raj Sharma, Hin. Secretary of SNEH management committee was also present on the occasion. 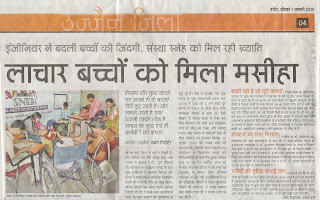 SNEH publicize widely in media about the NIRAMAYA Health Insurance Scheme of National Trust. 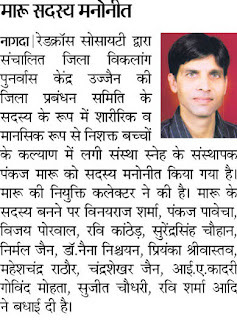 Press release in all leading News Papers were released about the scheme and its benefits. 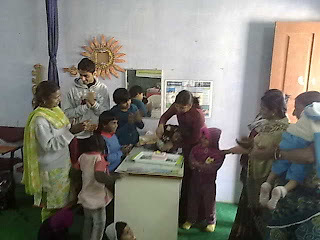 MAny new people came up for registration under the scheme..
SNEH kids celebrated raksh bandhan. Kids tie up the Rakhi to each other and enjoyed the festival a lot. Center Head Dr Naian Christian arranged the sweet dish for all the kids. Kids understood the importance of this festival and also understand how to make a knot in the Rakhi. It was a new learning for them. 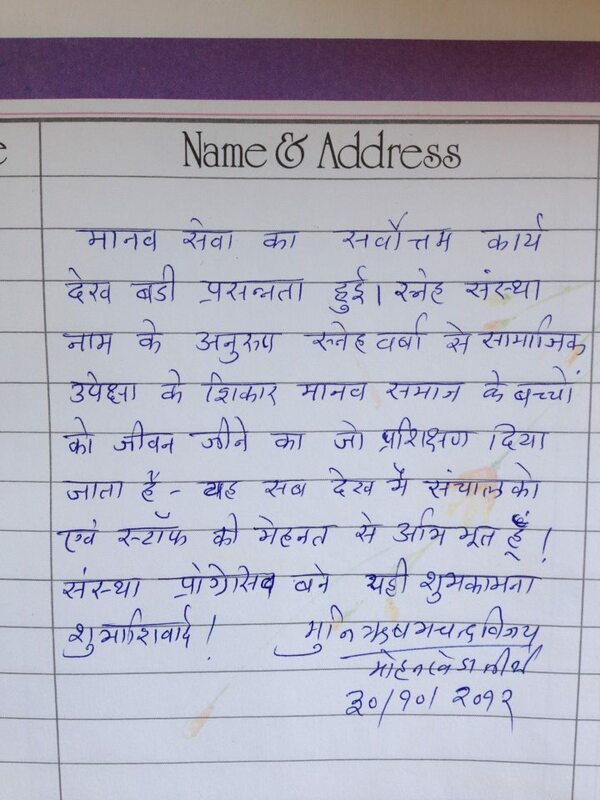 Management committee member Mr Surendra Singh Chouhan & Pankaj Maru were present on the occasion. 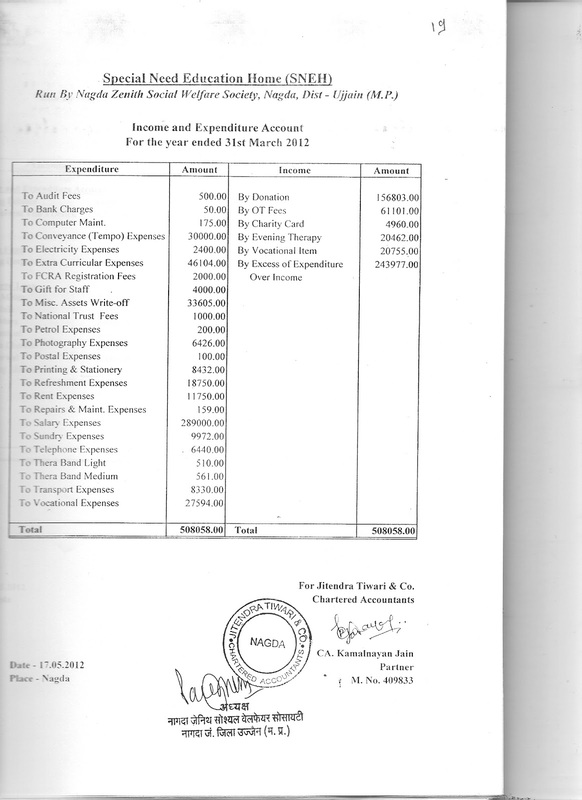 LANxess India Pvt. 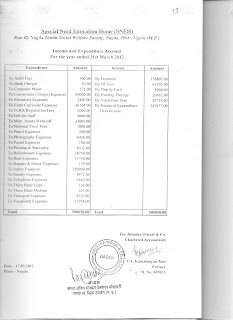 Ltd., which supported SNEH in its beginning stage, once again contributed INR 3.0 Lacs under its CSR Scheme. In a grand function organized by LANXESS in community hall, the cheque of 3.0 Lacs was given to SNEH team by the SR. Executive Director Mr Neelanajan Benarjee. 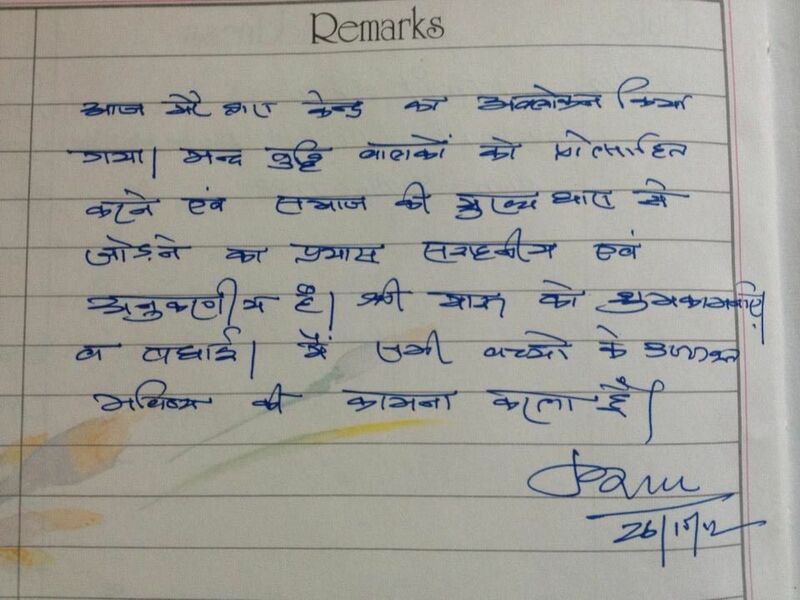 He extended his best wishes and support for SNEH waork. The Unit head Mr Bappa Bandopadhyay who played a very importanat role in getting this support also praised the work done by SNEH. Municipal Council Chairperson Mrs Shobha Gopal Yadav, Vice chairman Mr Sajjan Singh Shekhawat, Ex Minister Mr Dilip Singh Shekhawat, SDM Mr Santosh tegore, CSP Mr Deepak Shukla, I.PS. 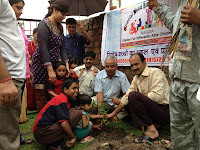 Mr Kalan Chakrawarti, NAgda Congress Committee President Subodh Swami, Journalist, prominent citizen, SNEH Kids and staff were present on the occasion. 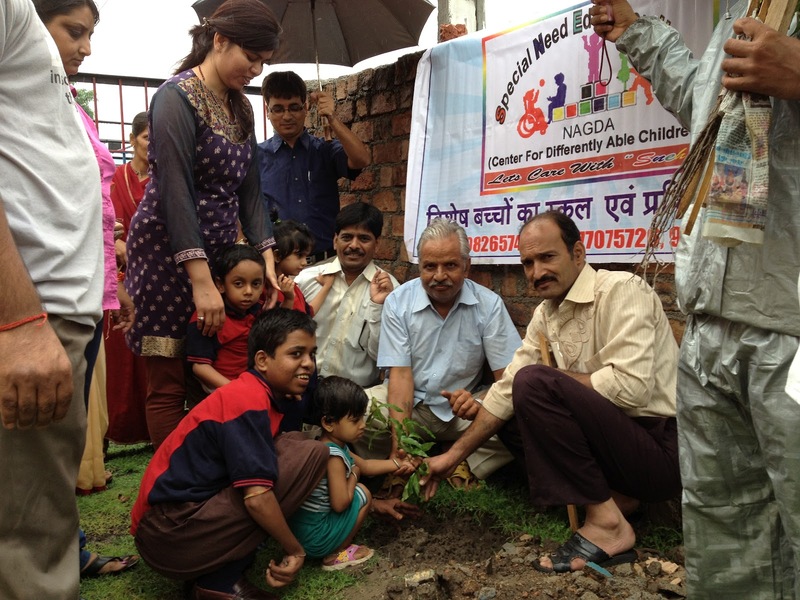 Founder & President of SNEH Mr Pankaj Maru gave a presenation on the work done by the SNEH. Mr Hemant Soni Conducted the program. H.R. head of Lanxess Mr Virendra gave the vote of thanks. 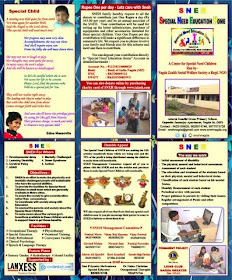 SNEH is one of the best NGOs of the MP. 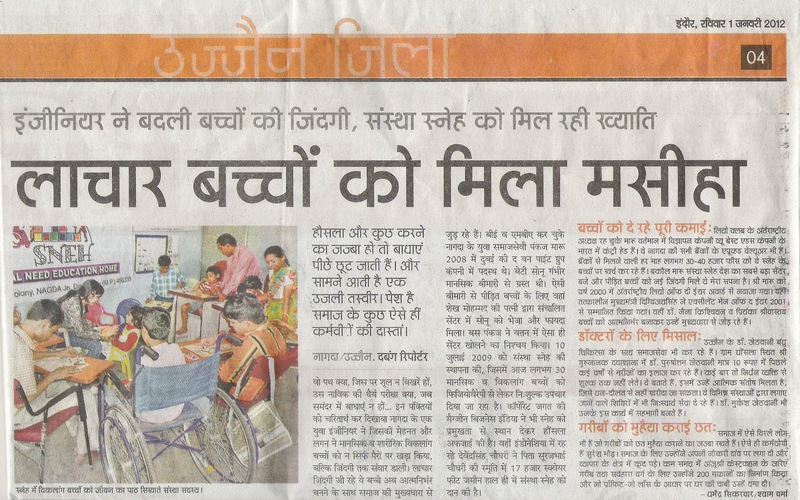 The Social Justice department will support it in best possible way. 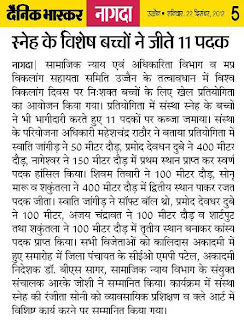 Mrs Geeta Kamthe , Joint Director of the Social Justice Department expressed her view on the occasion of distribution of 70 certificates to Special Need People based on which their pension of Rs 500.00 per month from the govt of MP will start for life time. SNEH initiated it and arrange from the survey, IQ test, certification, Bank account opening & fill up of forms to get it sectioned. Now all 70 people get Rs 500.00 per month in their bank accounts directly. 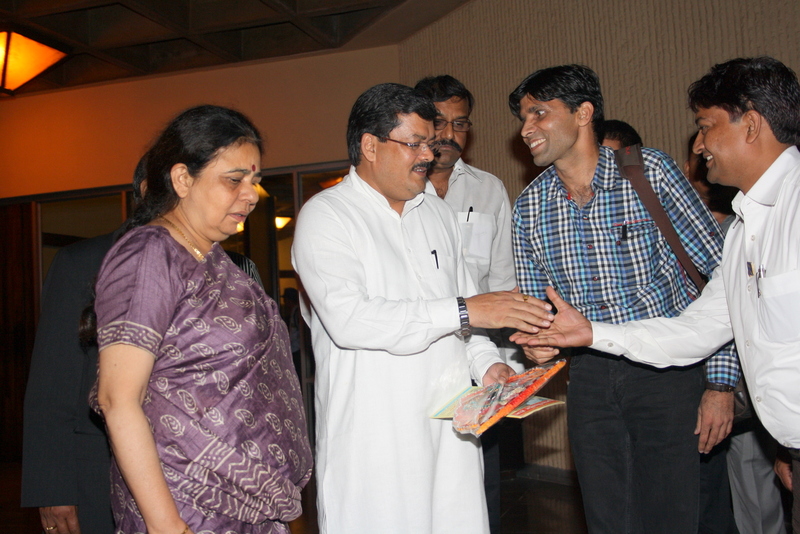 SDM Shri Santosh Tegore, CMO Shri V.S. 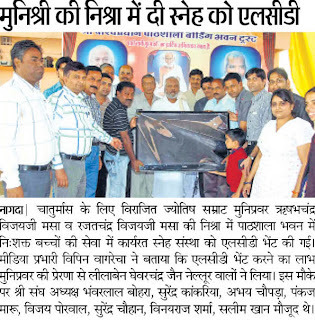 Chaturvedi, BAl & Mahila Vikas officer Shri Mardul Malviya were also present on this occasion. 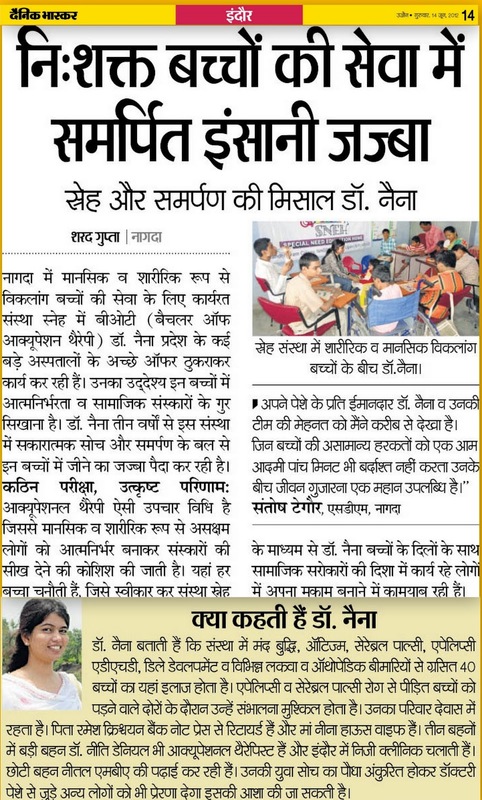 SNEH organized a checkup camp to test the IQ & make the Disability certificates from the district medical board. 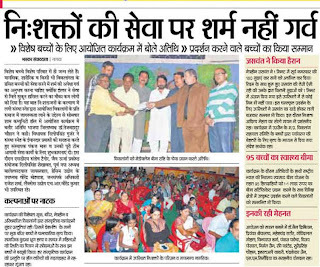 More then 100 Special Need people participated & get benefited. 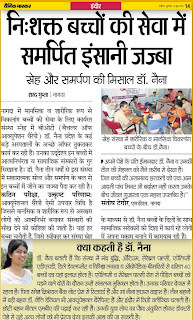 Dr J.P Sharma from Ujjain conducted all the test. SNEH got the Best Activity of the Region Award & Dr Naina got the "Most Serving Lion of the Region"
SNEH got the Best Activity of the Region Award in the regional conference held at Nagda on Sunday 5th Feb.BJP National General secretary Lion T.C. 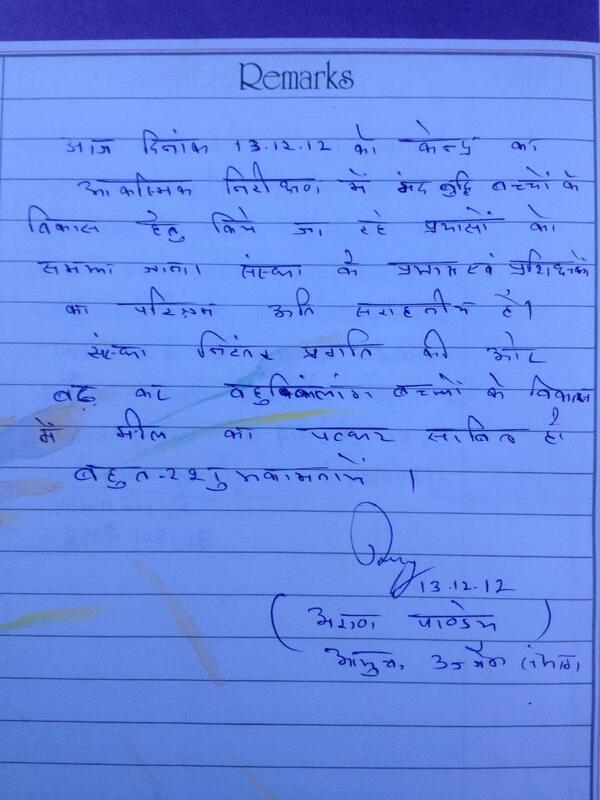 Gehlot, Past Multiple Council Chairman lion O.P. 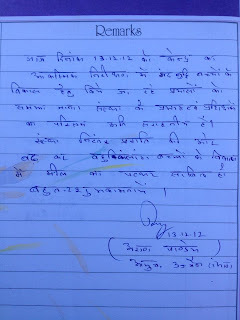 Agarwal, past Multiple Council Secretary lion Atul Mittal, PDG Lion I.A. Quadri & region Chairman lion C.S. 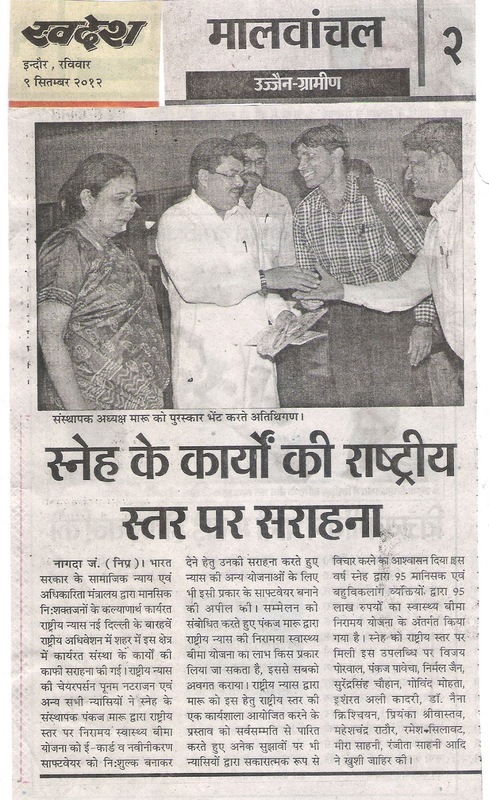 Jain presented trhe trafee to SNEH staff. Sneh centre head Lion Dr Naina Christian was awarded with the "Most Serving Lion of the Region" among 300 lions of the region. 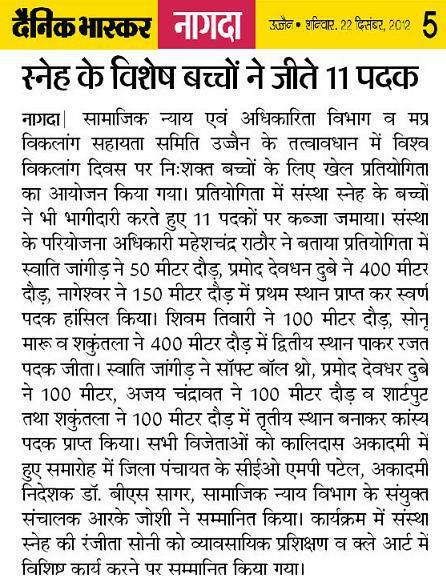 Congratulations to whole SNEH team!!! SNEH celebrates the republic day with kids and their parents. CSP Nagda Mr Deepak Shukla, chief guest of the function, hosted the national flag. , Kids presented a march past also. 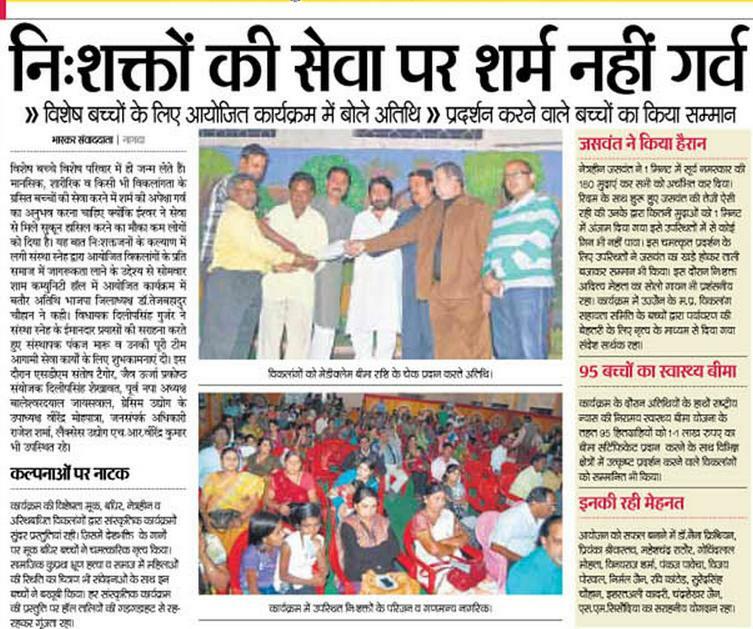 TI Mr Mohan Sarwan & TI Birlagram Mr Dherya Sheel was also present as guest of honour. CSP Mr Shukla announced to take all the kids to Onkareshwar on 7th Feb. 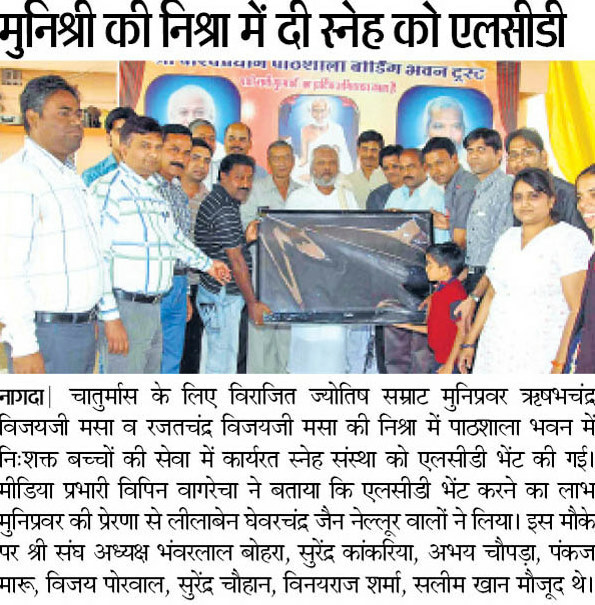 He also distributed the Uniform giuven by Lion Ajay Garwal to all the kids on the occasion of his birthday. Sweets are distributed at the end of the program.